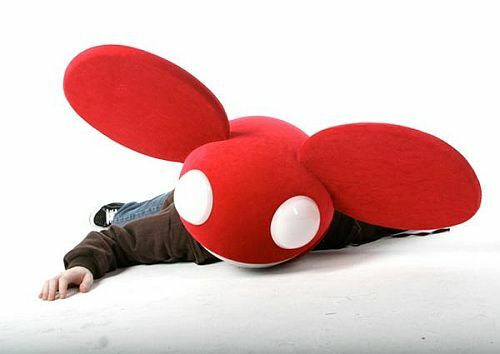 Deadmau5 is a Progressive House DJ from Toronto who has recently shot to popularity. From being relatively unknown a few years ago, he has in the last year or two won Juno awards, Grammy nominations, and various accolades from electronic music magazines. Armin Van Buuren named him Best Producer of 2007 in DJ Magazine. All of that, while performing on stage with a gigantic purple mouse head helmet. 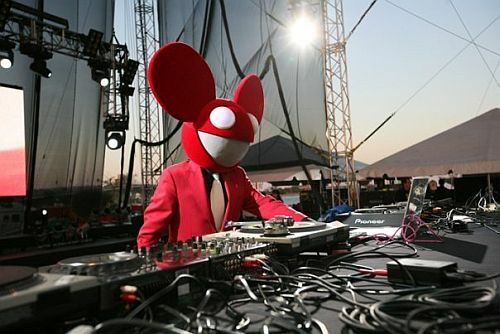 His music is labeled as “Progressive House”, but also contains elements of Electro, Trance and a variety of other monikers. I’m so bad at genre distinctions, so I just label his stuff as “Good Music”, which is really the only genre I worry about. His label is "Mau5Trap", you can sign up for "mau5mail", and if his fanclub aren't the "Mau5keteers", I'll be very disappointed. I actually saw him live about a month ago, performing in Toronto at the Kool Haus. It was really intense, and he had a lot of energy up on stage. Great music, great atmosphere, and this one girl stripped down to her knickers and danced on a riser for 3 hours straight. Ghosts N Stuff was the first song that I found when I searched for Deadmau5′ music (A friend recommended I check out the show and I had never heard of him before). I listened to the first few minutes and immediately bought my ticket. This track is very crunchy and reminiscent of the French electro scene which I very much love. The sort of music I can’t help getting up and dancing to. Great for running too! The other two songs below are from his 2008 debut album “Random Album Title” (Ghosts N Stuff is a single). I Remember (video above) is one of his mega hits and might appeal to the softer crowd, as it’s much more laid back and features some lovely female vocals. A great tune to relax with after the energy of the MSMOTD. Slip is another track from the same album and is a bit more edgy/suspenseful. It sounds like an evening drive through a city of the future. Great track. The whole album is actually very good, and he has a whole SLEW of original work and really amazing remixes. He actually became known as a remix artist before moving into full-scale original production. How can you not have fun at a show like this? Anyways, if he’s in town, definitely go to his show! Good music, silly costume, awesome light show and lots of fun. Let me know what you think in the comments! Purchase his 2008 album Random Album Title from Amazon, or download Ghosts N Stuff from their MP3 service. So many things to say about this artist! First of all, I lovelovelove his music, and fully had my own dance party in my room when I heard it haha. Ghosts N Stuff: LOVED this. SO Gothic meets ElectroSynthAwesome, as if a haunted house were having some sort of weird disco dance party. I can just picture an overview of a quiet cookie-cutter neighbourhood and then the camera hones in on this HOUSE with like no windows and vines and stuff, doing the Electro-Macarena. 2:50 – 3:30ish: Frankenstein/White Lady danceoff! I Remember: Cool music video, beautiful lyrics, loved the layered synth and ethereal female vocals as well as driving beat throughout most of it. Slip: Okay, mixed feelings on this one. The melody seemed slightly off, like there was some kind of hitch in how fast I would personally want the beat to be going. I liked the beat around 2:25, 3:23, and 3:55, as well as loved the jagged synth in 4:54. 5:25 had a brief bit of the counterbeats I was wanting from this, and though it was a weird song, and like you said, oddly suspenseful, I actually really liked it as well. I enjoyed his performance very much. Thanks for sharing. Get an autographed copy of "Mons", my self-titled debut.